At 23:03 on 2014 Dec 21st, the Sun “stood still” as it switched from moving south to heading northwards again – this is the solstice, the word deriving from the Latin for stationary Sun. For northern hemisphere observers, on the December solstice the Sun reaches its lowest noon-time position of the year. From then on, the Sun gets to a higher point at noon each day, marking the turn towards spring and a new year. The annual movement of the Sun and its link to time and the calendar has been tracked for thousands of years by many civilisations. 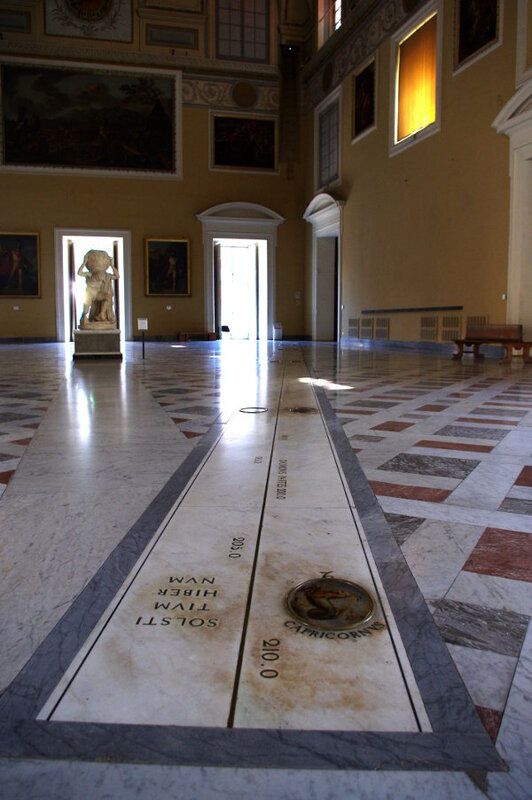 One of the more artistic and engaging ways of measuring its position is with a Meridian Line. 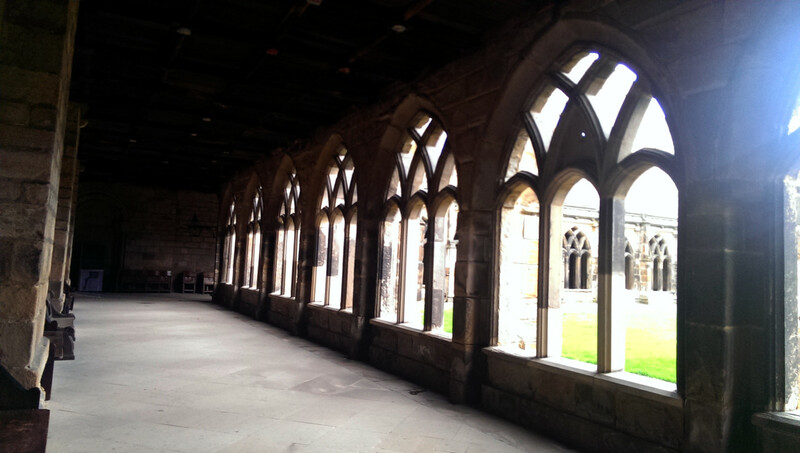 My fascination for Meridian Lines started on a visit to Durham Cathedral when a small hole above one of the arches in the cloisters was pointed out to me. Below the arch an intriguing inscription is carved into the flagstone floor – a mark like an arrowhead with the words “MERI” and “DIES” to either side, and alongside, the characters 5’, 10’ and 15’. The markings in the floor and on the wall viewed with my back to the arched window (click for a larger view). 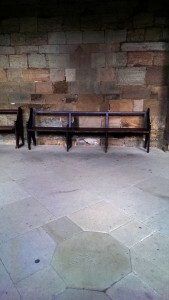 “A meridian line was drawn in the cloister of Durham Cathedral, partly on a south wall and partly on the pavement, in 1829, by Mr. William Lloyd Wharton, of Dryburn, and Mr. Carr, then Head Master of Durham School. The description of this, written some years ago by the late Rev. Temple Chevallier, will serve for all. When I visited the cathedral in the morning of 2014 Oct 25th and took these photos, it was a pretty cloudy day. 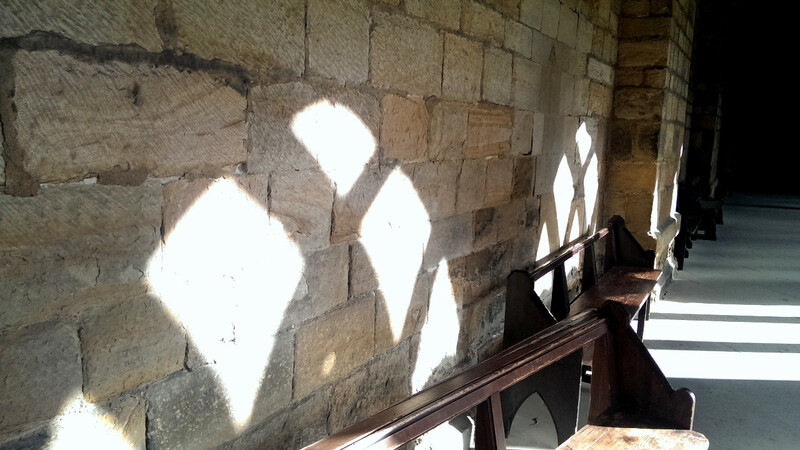 But eventually the sun broke through and I was able to capture the luminous image of the Sun on the wall opposite the arched windows. It was below and to the left of the meridian mark because the photo was taken before noon and the Sun was not yet at its lowest point of the year at midday. 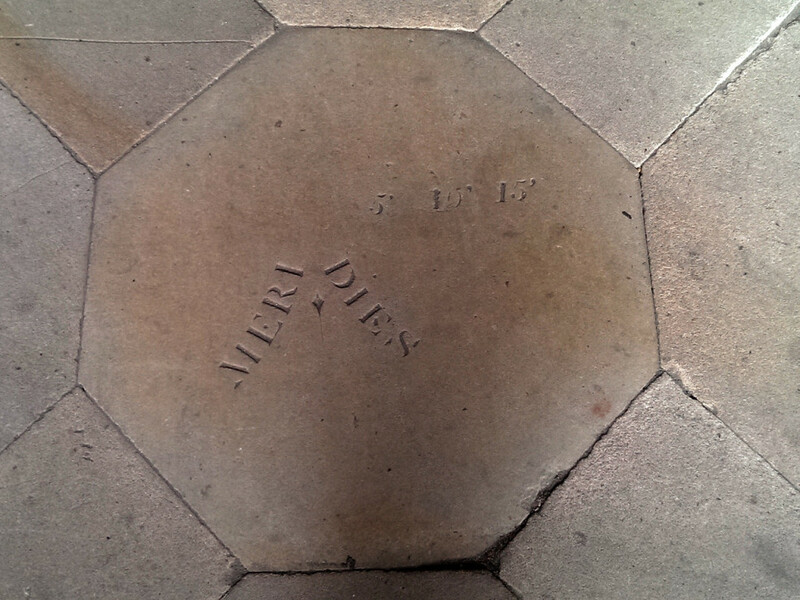 There are a number of well-known meridian lines at the Royal Observatory Greenwich. The most famous is the Prime Meridian at zero degrees longitude, defined in 1851 by the position of George Airy’s Transit Circle Telescope. But there are several other earlier meridian lines nearby: Bradley’s Meridian (c1750), Halley’s Meridian (c1725) and Flamsteed’s Meridian (c1689). These Greenwich meridians were designed to be used with telescopes, accurately defining the time at which the Sun and other astronomical objects pass through crosshairs in the field of view as the Earth spins. But I have to admit to having a soft spot for the rather less technological meridian lines like that in Durham, in which sunlight passing through a hole is cast directly onto a north-south line inscribed in a floor or wall. There are several others of these in England. According to Douglas Bateman in this article (pdf) for the September 2008 Bulletin of the British Sundial Society, the one at Bramshill House in Hampshire is inaccessible to the public because it is now part of the national police training college. 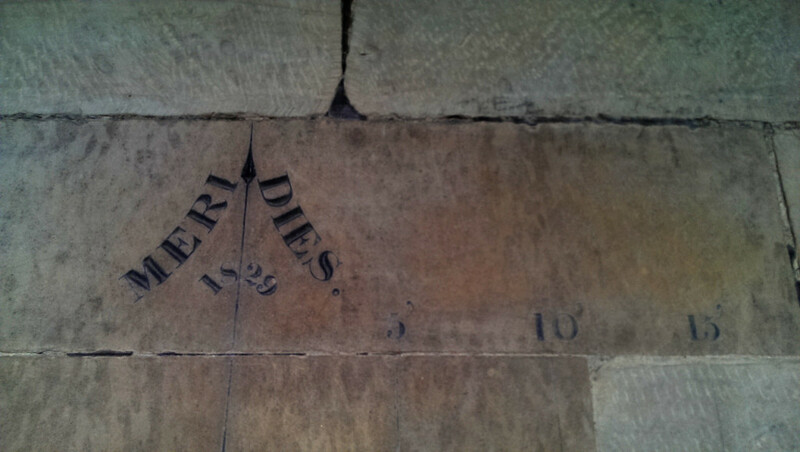 It is described in detail by Bateman who suggests that this may be the first British example of such a meridian line, dating from around 1720. Two other lines are known: at Ramsgate Maritime Museum in the Clock House on the quayside and at Bromley House Library in Nottingham. 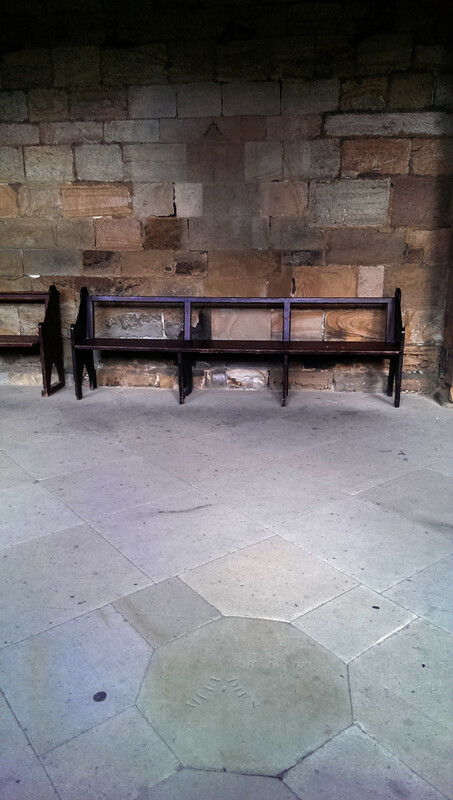 This latter meridian line consists of a brass strip in the floor of one of the first-floor rooms, now revealed after many years hidden beneath a carpet. 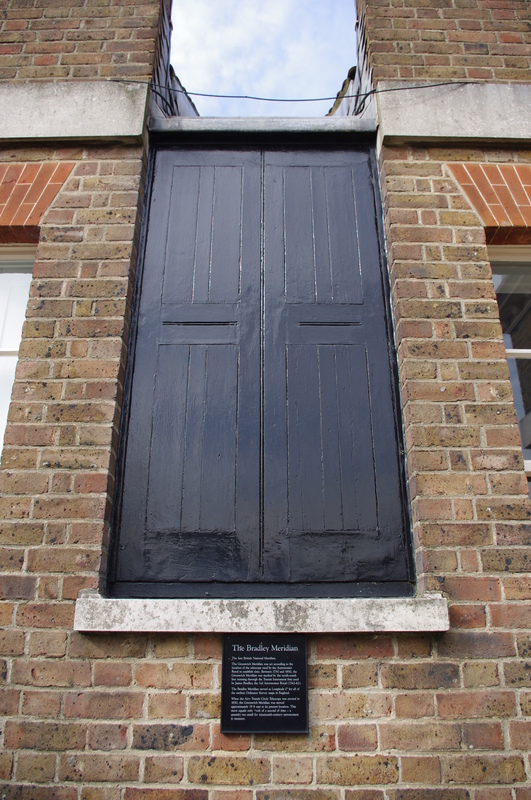 One of the window shutters contains the small hole to let through the sunlight, indicating local noon as it passes across the brass strip. 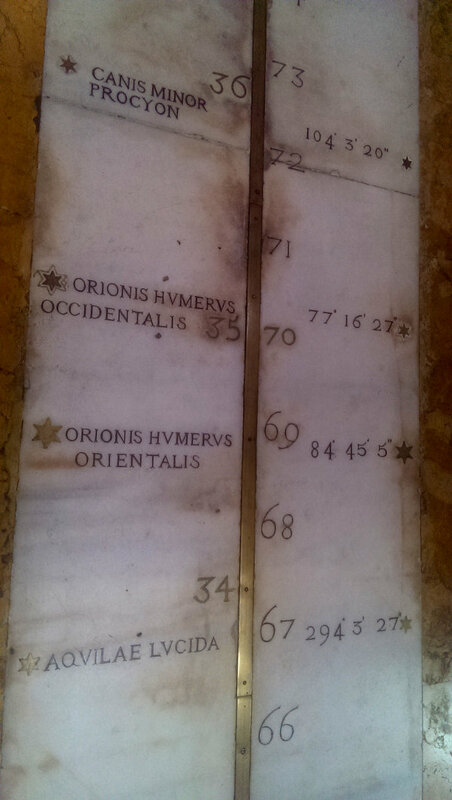 Following the death of Medici, Danti was transferred to Bologna in 1575 and set about creating another great meridian line in the Basilica of St, Petronio. Sadly, for various reasons described by Heilbron, this was a rather crude affair. However, 80 years later in 1655, the great astronomer Cassini succeeded in replacing this with a vastly improved and accurate meridian line in St Petronio which exists to this day. Unfortunately, I’ve not yet visited the St. Petronio or St. Sulpice meridians (the latter featuring rather notoriously recently in Dan Brown’s Da Vinci Code). However, I have visited two others, in Rome and in Naples. 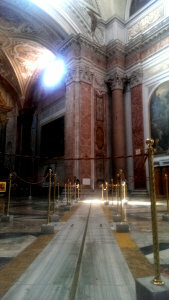 The Santa Maria degli Angeli e dei Martiri meridian line. The aperture in the wall is just visible at the top. Next time you’re in Rome, make sure you visit the Basilica of St. Mary of the Angels and the Martyrs. 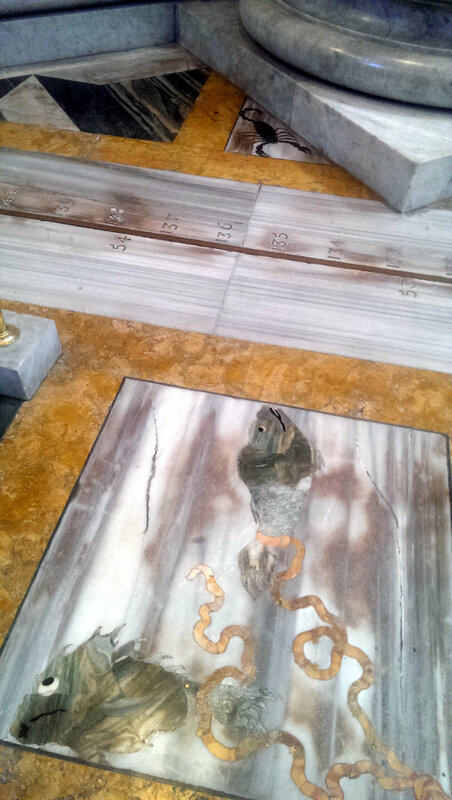 Laid diagonally across the floor and protected by guard ropes is a quite beautiful meridian line, 45 metres long, made of bronze and surrounded by marble flooring. 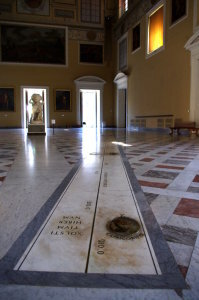 This meridian line was built by Francesco Bianchini and completed in 1702. It had been commissioned by Pope Clement XI, in part to check the calendar but also to compete with Cassini’s Meridian in Bologna. An excellent technical description of the Rome Meridian is provided in this webpage by Jurgen Giesen, including an applet allowing you to calculate the position of the solar image at any time of the year! 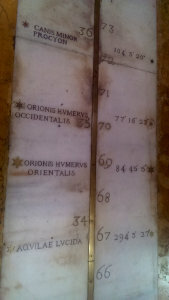 The Naples Meridian Line with the aperture visible at the top. At the near end of the line is the “Solstitium Hibernum”, the Winter Solstice, when the Sun is lowest and its image reaches farthest along the line at noon. The National Archaeological Museum in Naples is famous for its collections of Roman artefacts from Pompeii and Herculaneum, including the rather racy Secret Museum. However, don’t miss out on a visit to the Gran Salone della Meridiana (Meridian Room). “The room underwent transformations between 1790 and 1793, when it was decided to install an Astronomic Observatory in the North-West wing at the suggestion of the astronomer Giuseppe Casella. However, the project was soon abandoned and only the meridian on the floor was built, giving the room its name. Newgrange – the Irish passage tomb constructed around 3,200 BC. At dawn on the days around the winter solstice, a shaft of light enters the passageway through a hole above the doorway and illuminates the wall in the central chamber. 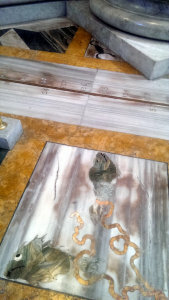 These days, a lottery is held to select who can be present within the tomb to witness the event. Chankillo –“The Thirteen Towers of Chankillo run north to south along a low ridge within a fourth-century B.C.E. ceremonial complex in north coastal Peru. From evident observing points within the adjacent buildings to the west and east, they formed an artificial toothed horizon that spanned—almost exactly—the annual rising and setting arcs of the Sun.” – Ghezzi & Ruggles 2007. Clearly these days we don’t need buildings or meridian lines to measure time – we use atomic clocks and radio telescope observations of quasars. 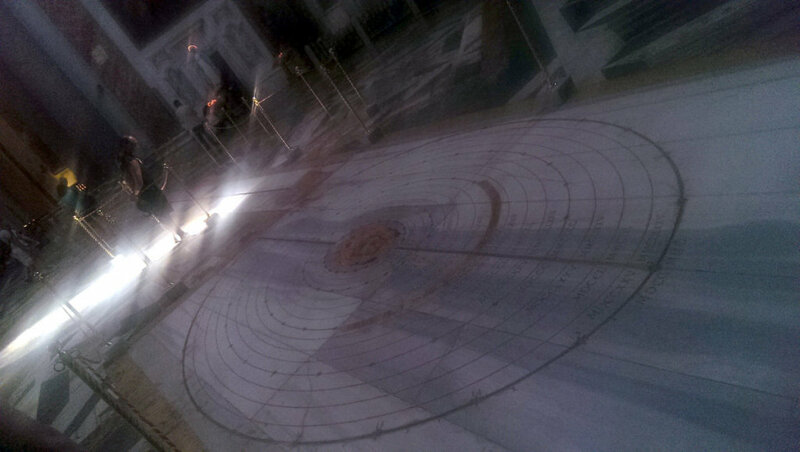 But there is something magical about seeing an alignment or the image of the Sun creeping across the floor towards a meridian. I for one, hope we’ll carry on building them. Whilst planning construction of your own Stonehenge or Chankillo, you can use this brilliant website by Demeter Sztanko (@sztanko) to check whether you live on a street that is already aligned with sunrise or sunset on the solstices. Ours does. Now if only it weren’t so cloudy in Manchester!